I usually serve this cake with my homemade lemon curd and I use the same mixing bowl and beaters for the cake. Since I don't wash them in between the cake has just a touch of lemon. This cake is extra moist and tender. 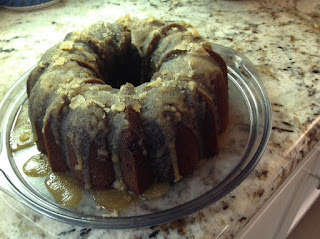 I have, at times, added golden raisin, chopped dates, pecans, and a little candied ginger and called it fruitcake. Good fruit cake. As my sister-in-law once said, "This is wonderful! It's what you always hope fruitcake will be but it never is." Cake baking tip: Be sure to let the butter, eggs, and water warm to room temperature if at all possible. It will make for a better rise and an improved texture. In a large bowl sift 2 1/2 cups of all purpose flour. Then remeasure and remove 2 1/2 cups from the bowl and put it back into the sifter. Some of the first will be left and will not be used. Add, one at a time, scraping the bottom and sides of the bowl after each addition. 1/2 cup of Louisiana or East Texas dark cane syrup. starting and ending with the flour. Mix just until smooth. Pour the glaze over the warm cake. I usually have a plate under the rack to catch the glaze that runs off so I can pour that back over the cake.. The granulated sugar gives the cake a sugary coat which is another nod to Pfeffernüsse. 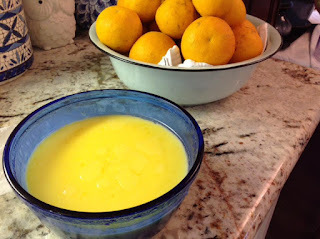 I like to garnish the cake with a good dollop of lemon curd and either a small dip of vanilla ice cream or whipped cream.